Ginger does not grow in The Shire. There is no ginger tea, ginger biscuits or ginger sweets. 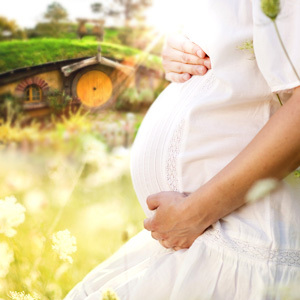 Hobbits had to make other clever plans with their pregnancy-related nausea problems. Are you pregnant, desperate due to constant or extreme nausea and tired of hearing about ginger biscuits? Continue to read. The Hobbits have shared their secrets of how to keep the nausea at bay (or chase the nausea away). Herewith then, the bestest advice from The Shire on how to prevent morning sickness. Hobbits love breakfast so much, they have three! They start with First breakfast and then Second breakfast followed by Elevenses! Shortly after waking up have something that will satisfy your hunger slightly, without giving your stomach a fright. Some women need to stay in bed and have this first before they get up, otherwise nausea kicks in after getting up and before they get to eat something. No other juices, just water or herbal tea. Coffee comes AFTER Second Breakfast or even better, after Elevenses. It should be safe now to move out of bed. Get up and get ready to have your second breakfast. The Second breakfast needs to be light, rich in fibre or roughage and high in nutrition. It should not raise the blood sugar fast at all, but give you nice comfort-fuel to function on for a few hours. Cooked oats with apple and cinnamon with a bit of whipping/pouring cream. Cook the apple first, with cinnamon in the water, and then add the oats. It is very tasty and sweet that way. Avoid milk and try to go without any added honey or sugar. The apple and cinnamon together with/without cream is sweet enough. Bircher muesli or raw oats soaked briefly in water, mixed with grated apple, desiccated coconut, berries, crunchy nuts or seeds, cinnamon (according to taste) and for those who like yoghurt, add yoghurt. Again no milk, sugar or honey. The timing of the Elevenses is quite important. You need to have Elevenses before you get hungry again after your first breakfast. Depending on the time and size of your second breakfast and your own personal metabolism you need to shift this a little earlier or can have it a little later. However, it is mostly recommended to have it around 10:00 or at the latest 11:00 in the morning. Elevenses needs to be a stabilising, protein-rich meal. You basically want some protein, some veggies and some good oils. Fried/poached eggs with mushrooms, spinach and tomato. Add some cheese if you like. Omelette with fresh basil, feta, tomatoes and mushrooms. Fish and vegetables (light – white fish, such as hake). Add olive oil to the veggies. Seed crackers with goat’s cream cheese (chevre), gherkins and olives. Seed crackers or oatcakes with avocado, salted with Herbamare salt, and microgreens. Boiled eggs on seed crackers with butter, gherkins, olives and microgreens. After Elevenses, while your tummy is still nice and full, it is time to reward yourself with your one coffee for the day, if that is what you are comfortable with during your pregnancy. Avoid milk, because milky coffees can certainly worsen or trigger nausea. Have a lovely short espresso or a longer one or an Americano. The short espresso has the least caffeine. You can mix it with coconut oil if you enjoy the bulletproof version. Add some whipping/pouring cream if you prefer not to have black coffee. You can even ask for pouring cream on the side with your coffee in Cafes and Restaurants. Have a good lunch at around 13:00 or 14:00 and dinner 18:00/19:00 if you can. Go to bed early – not after 22:00 if possible. Snack on something like a piece of goat’s cheese or good quality cheese at night if you are hungry. Seed crackers also make good late night snacks. Spend time with real friends and family during meals or just chill and enjoy some quiet time. If life is extremely busy, turn your phone face down or don’t even take it out during meals. No eating in front of a computer. Phone activity and work during meals can increase stomach stress and nausea. If the family members you are spending your various breakfasts with are your first kids – toddlers…. Good luck! Still try to prioritise your needs for everybody’s sake. Consider adding a Vitamin B6 and Magnesium supplement to your daily routine, it can certainly make a very big difference in preventing nausea. Talk to a professional health care practitioner before taking any supplements while pregnant. Supplements are not all safe just because they are “natural”. The B6 and Magnesium needs to be the right type and the right dosage for pregnancy. Enjoy the many healthy happy meals! And keep an eye out for more healthy secrets from around the world.